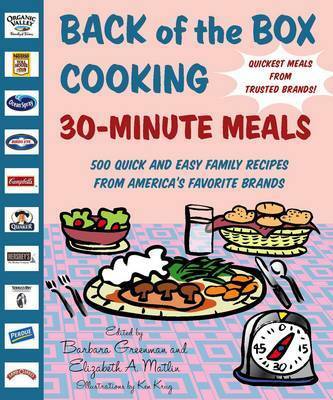 A new time-and money-saving collection of your favorite brand-name recipes! Whether for a family weeknight dinner, a brunch with friends, a potluck supper, or a school bake sale, the recipes in this delectable book incorporate fresh ingredients, trusted family brands, and take less than 30 minutes to prepare! 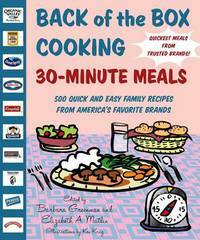 In this companion volume to Back of the Box Cooking, emphasis is on meeting the needs of busy families who still want to bring to the table yummy and healthful foods that everyone in the family will enjoy. With the top-rated recipes from the Web sites and test kitchens of such trusted brands as Campbell's, Birds Eye, Quaker, Cascadian Farm, Newman's Own, Nestle, General Foods, and more, this book offers time-saving tips, a pantry list, and the opportunity to create home-cooked meals every day. Five hundred brand-new recipes include appetizers, main courses, side dishes, and desserts. This essential book for every busy cook ensures less time in the kitchen and more time at the table with family and friends. Barbara Greenman has developed and edited many cookbooks, including The American Century Cookbook by Jean Anderson, Family Circle All-Time Favorite Recipes, Family Circle Best-EverCakes and Cookies, and the America Loves... series by Linda West Eckhardt. She is also the editor of Black Dog & Leventhal's bestselling Church Suppers, Blue Ribbon Recipes, and Church Socials. She lives in New York City.